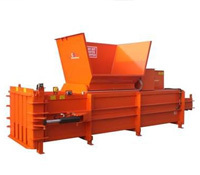 This horizontal baler is perfect for large volumes, processing up to 3 tonnes per hour, with the capacity to produce bales in excess of 1 tonne. The CK850′s efficient system will save you money by dramatically reducing labour time. Why Choose a Horizontal Baler CK850? For details of the CK850 horizontal baler, please see our PDF, available for download or printing with information including features and optional extras for this machine.